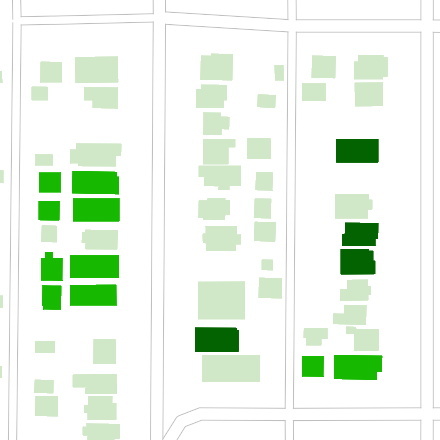 From Edmonton's Open Data Portal, specifically the Rooflines dataset and the Property Information dataset. How do I get a map of my city this way? Send me a shapefile (shp) map of the buildings that has a "yr_blt" integer field containing the year built. If you don't know what that means, it's probably something your city's open data initiative would understand and can try to get. What is your definition of "infill"? An infill home is a brand new home built in an existing, older neighbourhood. I had originally thought it meant a new home that increased density within a lot, but apparently that's not the case. You can think of people choosing to live in a new home within a mature neighbourhood as opposed to moving to the suburbs. How do you determine infill? 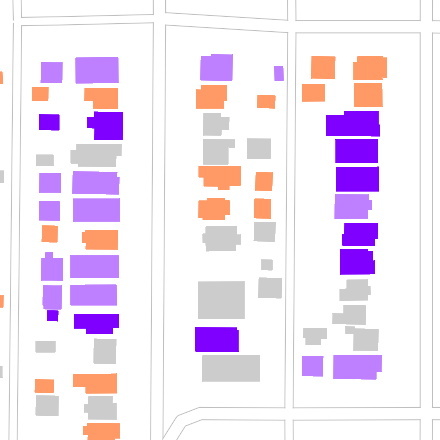 We're experimenting with the algorithm, and right now "infill" refers to buildings that are at least 30 years newer than the average of other residential buildings within a 500m radius. "possible infill" is similarly classed, but in the opposite direction. If a residential building is at least 30 years older than its neighbours, we classify that as "possible infill". There's a mistake with the map/I have other questions. Drop me an email at eugene@dha.io.